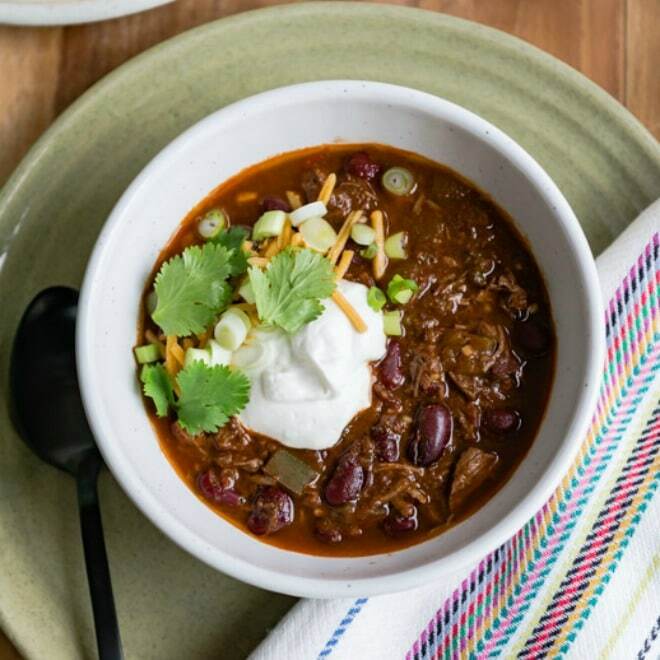 This recipe for easy Taco Soup recipe is one of my all-star hits, and I’ll bet you already have most of the ingredients in your pantry! Besides being delicious, Taco Soup is easy no matter where you make it: On the stove, in the crockpot, or in the Instant Pot. I’ve included the instructions for all the ways! And best of all, Taco Soup ingredients aren’t necessarily hard and fast rules—you can improvise based on your favorite Tex-Mex stuff; no matter what you add, the results are always amazing. So grab some ground beef and get cooking because it’s gotta be taco-thirty somewhere! 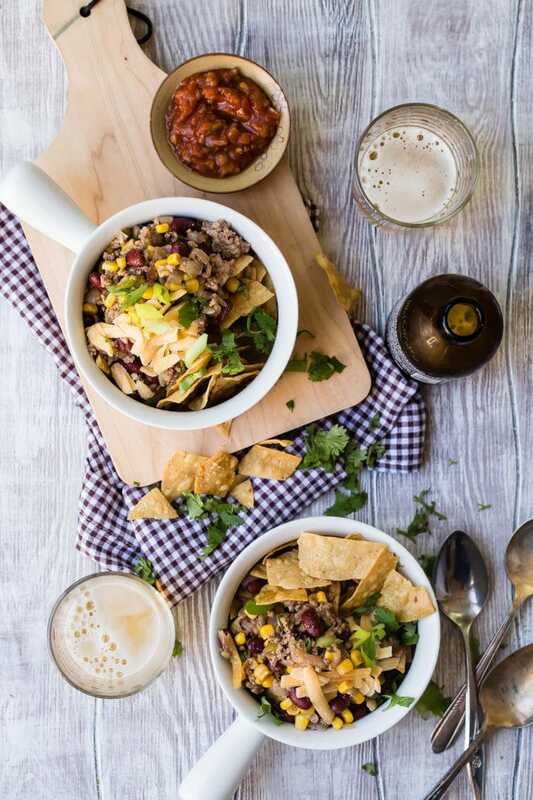 Need Taco Soup for Game Night or a team of hungry football players? Click and slide the number next to “servings” on the recipe card below to adjust the ingredients to match how many you’re feeding—the recipe does the math for you, it’s that easy. First, gather your ingredients: Some ground beef, an onion, a couple cans of beans, canned tomatoes, green chiles, and corn. 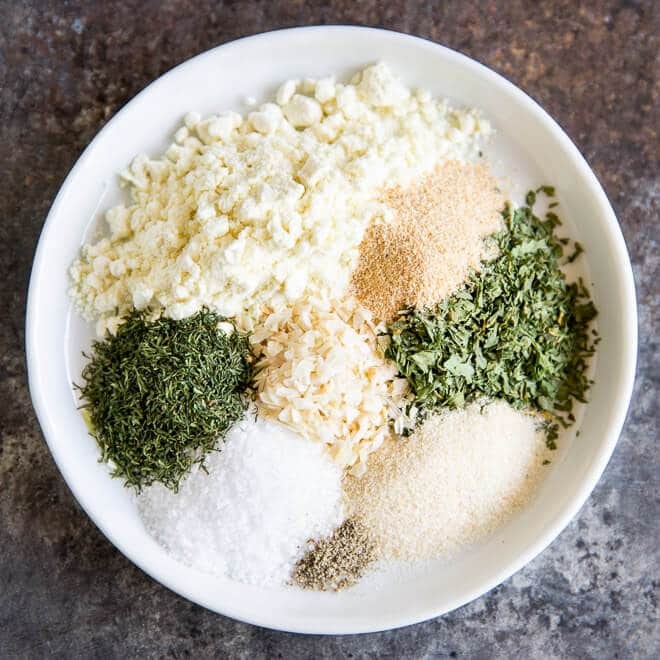 You’ll also need some ranch dressing seasoning and taco seasoning, which you can make in advance or purchase. After browning ground beef and onions in a large Dutch oven, you open all the cans you’re planning to use and dump them in the pot. 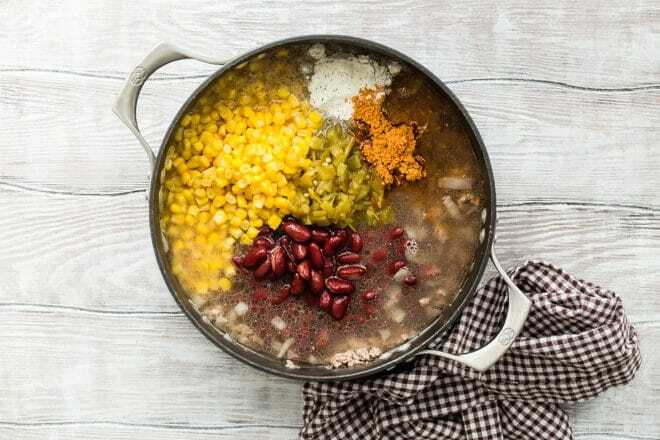 Go ahead, do it: beans, tomatoes, corn, chiles, liquid and all, then add some water and the seasonings and let it all simmer away until everything looks too good to resist. Come dinnertime, serve it bowls over corn chips or with flour tortillas on the side. Dress it up with toppings, as many as your bowl will hold. It’s a taco, after all. When you make your own meals at home, you get to control the ingredients you cook with and avoid hidden calories from sugars, fats, and preservatives, which is half the battle. Make this recipe with lean ground beef, then garnish with lots of onion, avocado, and cilantro. Instead of cheese or sour cream, try a spoonful of plain yogurt. I challenge you to find a healthier dinner! Taco soup is inherently gluten-free, as long as there isn’t any cross contamination from other ingredients. Just to be on the safe side, read your labels carefully! How do you make 8 can Taco Soup? Looking for 8 can Taco Soup? Add a can of black beans and a can of Ro*tel to the pot and you’re ready to go. Or throw in a can of whatever ingredient you can’t get enough of: Hatch chiles, black beans, pinto beans, extra corn…it’s your rodeo! How do you make Taco Soup with ranch dressing mix? Truly, in my opinion, ranch seasoning is the secret ingredient in this soup, which makes the soup more taco than chili. Go ahead, try it, even if you’re not a ranch dressing fan. I promise you you’ll like it. 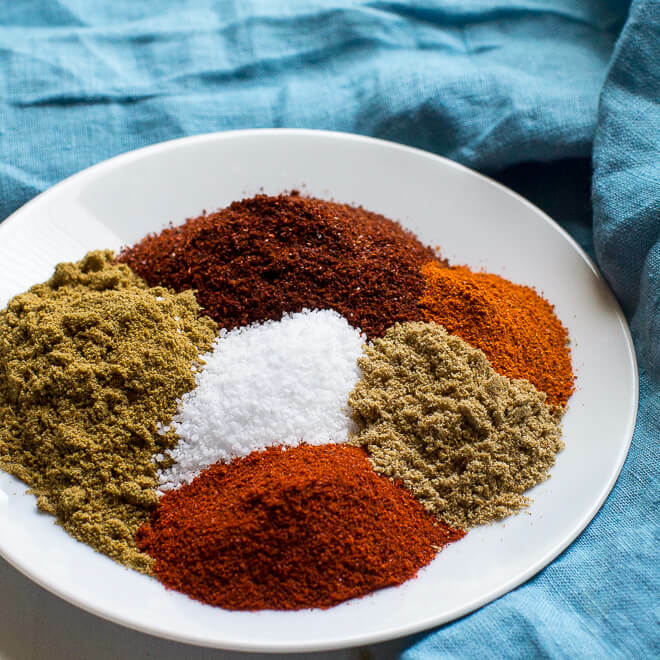 I have recipes for Homemade Ranch Seasoning and Taco Seasoning, too; you know exactly what you’re getting when you make your own. In a large Dutch oven or large stock pot over medium-high heat, cook ground beef and onion until browned, about 5 minutes. Drain well. Add water, beans, tomatoes, corn, chiles, and all juices from cans. Stir in taco seasoning and ranch seasoning. Bring to a boil, reduce heat to medium-low, and simmer for 20 minutes. Once hot, add the ground beef and onions, cook until meat is browned. Return the meat back into the Instant Pot. Add corn, beans, diced tomatoes, chiles, ranch seasoning and taco seasoning. Place the lid on and set the valve to “Sealed”. Press the “Soup” button and set timer for 20 minutes. Once the soup is done, turn valve to “Quick Release”. Combine the browned beef with everything else in your crockpot. Cover, and then cook on HIGH for 4 to 6 hours, or LOW for 6 to 8 hours. 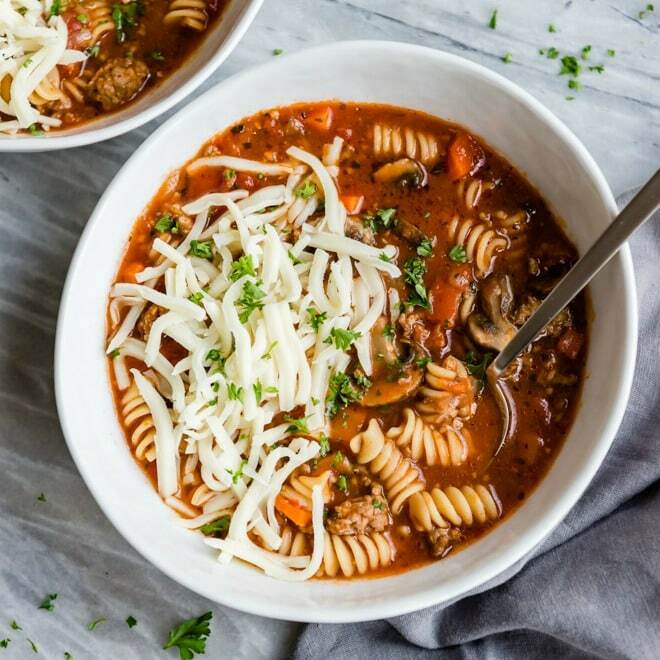 You don’t always have to make taco soup with beef! You don’t even need to add beans, if that’s not your thing. 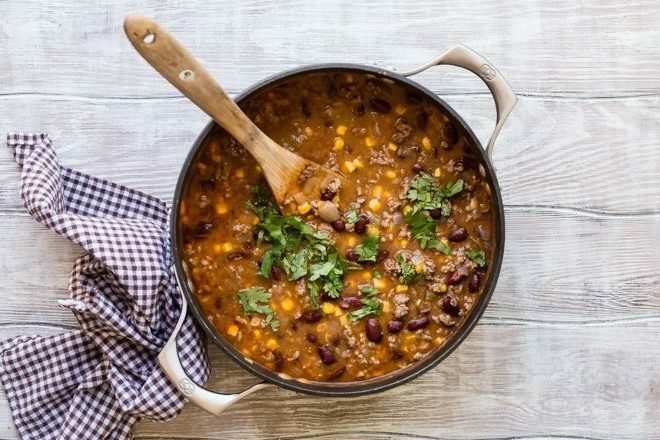 Read on to get some inspiration for making the best taco soup ever. Vegetarian Taco Soup: Skip the meat and add extra beans, extra tomatoes, and the vegetable protein of your choice. 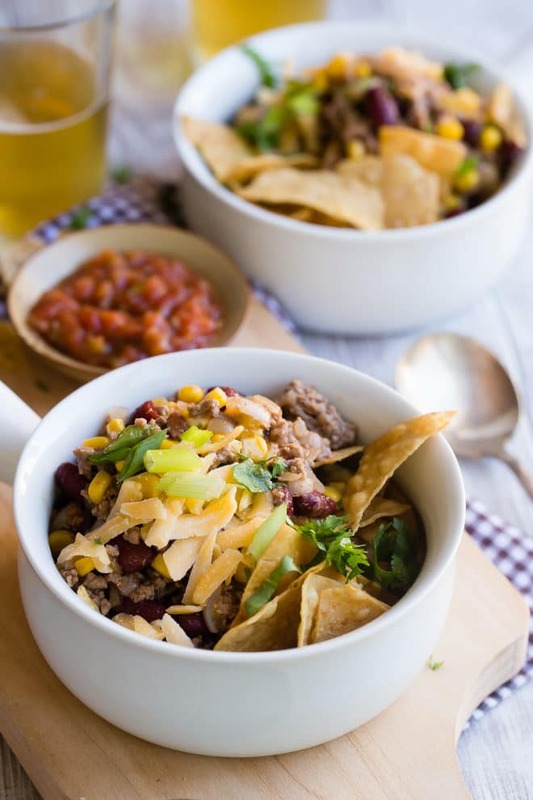 Taco Soup with ground turkey: Of course! Ground turkey or ground chicken, all of it works in this versatile recipe. 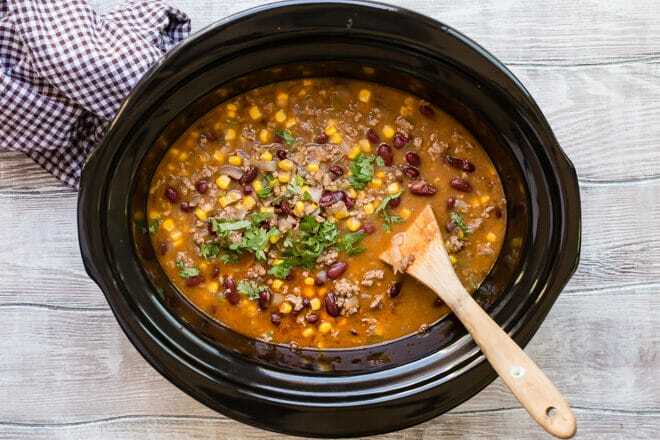 Taco soup with black beans: if you want to make this taco soup recipe with black beans, or pintos, or vacqueras beans, that is entirely up to you. Taco soup without corn: If corn is something you’d rather do without, then leave it out and add more chiles or tomatoes. No big deal. Taco soup without beans: Good for your heart, but, well… leave them out if you’d rather. Add more peppers, tomatoes, or meat. 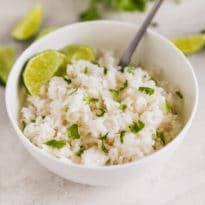 Try my delicious recipe for Mexican Rice to serve alongside big bowls of soup. Chopped cilantro to scatter on top, or chopped green onion and hot sauce. Slices of ripe avocado, to make things super healthy. Instead of corn chips, serve grilled flour tortillas on the side, or Frito chips. Just promise me you’ll have fun with it! Save this Taco Soup to your “Soups and Stews” Pinterest board! In a Dutch Oven or large stock pot over medium-high heat, cook ground beef and onion until browned, about 5 minutes. Drain well. Bring to a boil, reduce heat to medium-low, and simmer for 20 minutes. Or, transfer to a slow cooker, cover, and cook on HIGH for 4 hours or LOW for 6 to 8 hours. To serve, place tortilla chips in the bottom of a bowl and ladle soup over the chips. Top with shredded cheese, sour cream, or other toppings as desired. Adding the chips first sounds delicious! 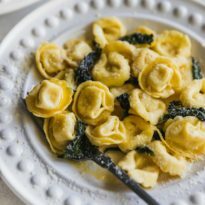 Sounds like a great and quick meal for a busy weeknight! I’ve never had a taco soup before – why not?? Now I have no excuse not to try it! Looks and sounds amazing, Meggan! This was my first time making taco soup, it was awesome!! Will definitely be making this regularly! Made this for the first time this past weekend and it turned out great! We just finished the last of it off! It says 12 servings, but what is the actual serving size? The recipe is good. I like your recipes.